Banana’s foster makes an appearance at your breakfast table instead of the dessert table! 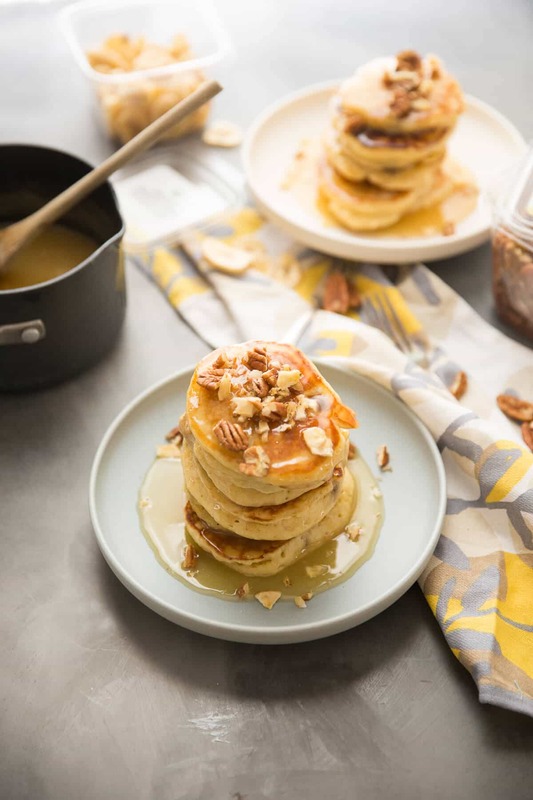 Banana pancakes, rum flavored caramel sauce and a nutty topping elevate ordinary pancakes into something extraordinary! When it comes to breakfast foods, I think there are two kinds of people. You are either an egg person or you are a sweet person. I know in my own family, when we make it to brunch, my husband always orders an omelet and I always order pancakes. That is the way it has always been. My kids fall on the pancake side of the aisle as well. None of us ever stray from our favorites. I’m not saying I don’t stray from pancakes, because I do. Sometimes I have Strawberry Cheesecake Stuffed French Toast and sometimes I have Caramel Apple Monkey Bread Muffins for breakfast, it just depends on how crazy I feel. No matter what, my breakfast tends to be sweet and a little syrupy. 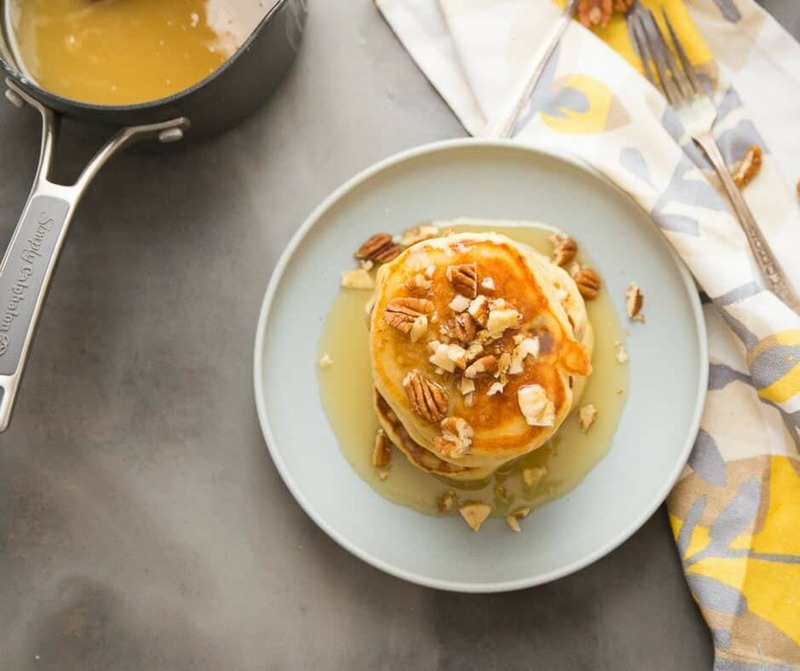 That is exactly why I am super excited to share this bananas foster pancake recipe. It is one of my absolute favorites! 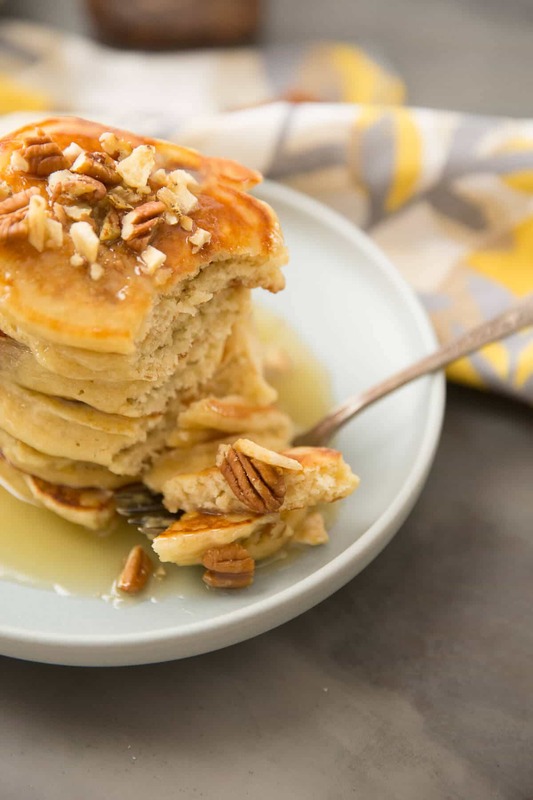 The pancake recipe itself is basic enough, except with soft, ripe, mashed bananas mixed in. The pancakes taste light and fluffy but hold up to the rum flavored caramel syrup. Yes, you heard me, I made a quick caramel sauce to drizzle over my pancakes. Please do not be intimidated by this sauce, it really is a matter of boiling the ingredients until they reach the right color, that is it. It is very simple. While traditional banana’s foster is made with rum, I added Kroger brand rum extract instead. Feel free to use rum and of course feel free to use premade caramel sauce. The toppings are the icing on the cake so to speak. I found pecans and banana chips in the bulk foods section of my local Kroger. They have a huge variety of bulk foods, from grains, to nuts, candy or dried fruit, Kroger has what you are looking for. The pecans and banana chips were the first things to catch my eye. 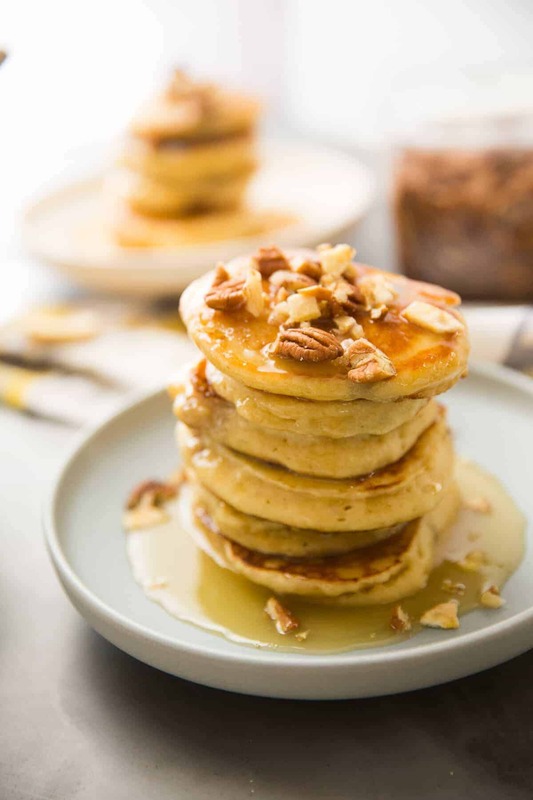 The pecans are not salted, but the crunch from the nuts and banana chips worked beautifully with the soft pancakes. Pecans and caramel are natural partners, (think pecan pie), but you could use almonds or walnuts as well! 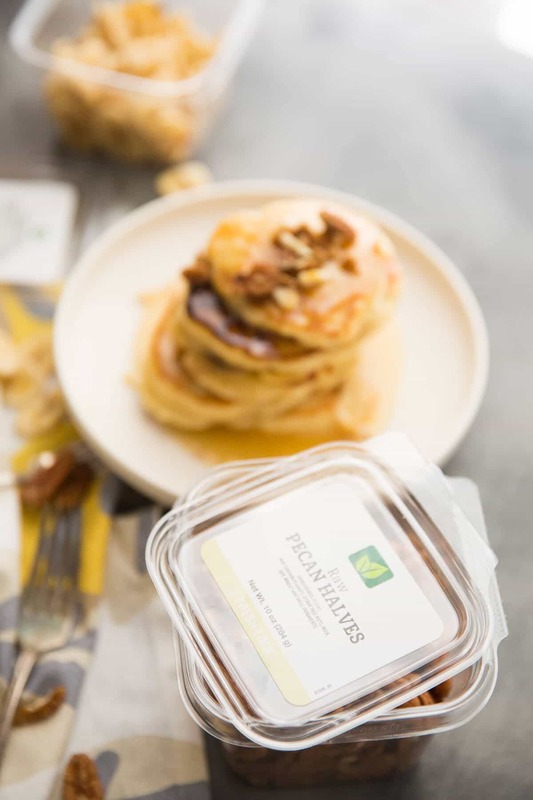 If your breakfast preferences is on the sweet side, then these banana’s foster recipe is for you. If your breakfast preference tends to be savory, well I think you should come to the sweet side! I’m proud to have partnered with Kroger to bring you this original recipe. Banana's Foster pancakes start with banana pancakes, homemade caramel sauce and lots of toppings! 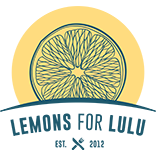 In a small saucepan, stir together the butter, sugar and lemon juice. Continue to heat until sugars have melted, stirring constantly. Continue to cook on medium heat until mixture is caramel in color, which should take 8-10 minutes. When the mixture is caramel in color, carefully stir in the heavy cream a little at a time. Remove from heat and stir in rum extract. Spray a griddle or a skillet with non-stick spray and heat over medium heat. Meanwhile, stir together the flour, both sugars, baking powder, and salt. In a separate bowl, whisk together the milk, the eggs and the vanilla. Carefully stir milk into the dry ingredients. Pour in melted butter and stir until combined. Blend in mashed bananas (batter will be lumpy). Pour out ¼ cup of batter onto the prepared pan. Heat pancakes for 2-3 minutes per side or until golden. 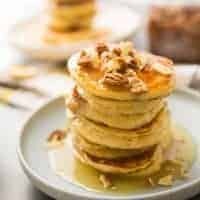 Serve pancakes with caramel sauce, chopped pecans and chopped banana chips.